“The World will note that the first atomic bomb was dropped on Hiroshima a military base. That was because we wished in this first attack to avoid, insofar as possible, the killing of civilians.”(President Harry S. Truman in a radio speech to the Nation, August 9, 1945). According to a leaked draft of the agenda, the secret meeting included discussions on “mini-nukes” and “bunker-buster” bombs with nuclear war heads “for possible use against rogue states”. 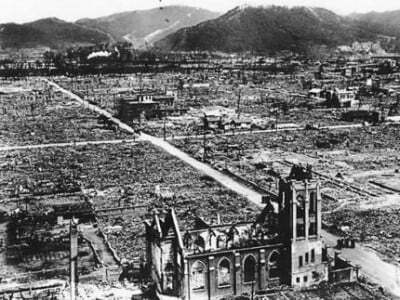 The firestorm in Hiroshima ultimately destroyed 13 square kilometres (5 square miles) of the city. Almost 63% of the buildings in Hiroshima were completely destroyed after the bombing and nearly 92% of the structures in the city had been either destroyed or damaged by blast and fire. To try and force the Japanese government to surrender (and no one in 1945 knew if the plan would work) by making it watch mass casualties of innocents, and then to hold the nation hostage to future attacks with the promise of more bombs to come, speaks to a cruelty previously unseen.